Barneys Farm Sweet Tooth is a new generation indica/sativa cannabis hybrid from the Barney’s Farm’s feminized seed collection. 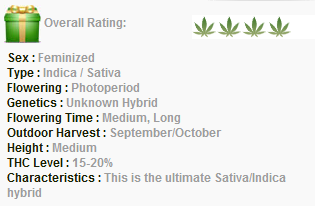 She is a 3-way cross of an Afghani x Nepalese Hash and a Hawaiian Sativa and possesses all highest qualities of her parents which made her a 2008 “High Times” Cannabis Cup winner. This marijuana is a high yielding, sweet and powerful plant that gives a perfect concoction of both a high and stoned effect. 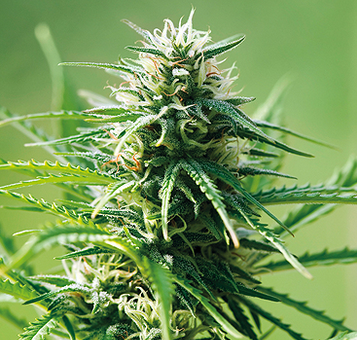 Sweet Tooth feminized cannabis seeds from Barney’s Farm are known as easy growing. They are all nearly 90% stabilized and show an excellent germination rate. It doesn’t take long before experienced cannabis growers can recognize indica characteristics in Sweet Tooth seedlings. The plants grow medium tall with strong side branches that need room to grow. They are all covered with white crystals and produce loads of bud sites developing into large potent colas sticky with resin. They do look like sprinkled with sugar, so yummy and tempting. Just give them 9-10 weeks to fully mature to get the most. Barneys Farm Sweet Tooth is a strain that can be easily managed. She responds positively to general nutrients and perform well in nearly all growing setups, both indoors and outdoors, and produce a good yield of up to 450 gr. per m2. She can easily double the yield under optimal conditions. Outside, harvests start at the end of September/beginning of October. Marijuana of this mostly indica strain is said to contain as much as 20% of THC producing strong “cerebral high” effect with a very sweet taste, an ideal weekend treat. What are your experiences with Barneys Farm Sweet Tooth, tell us about it below!